At K&M we are experts in three things. 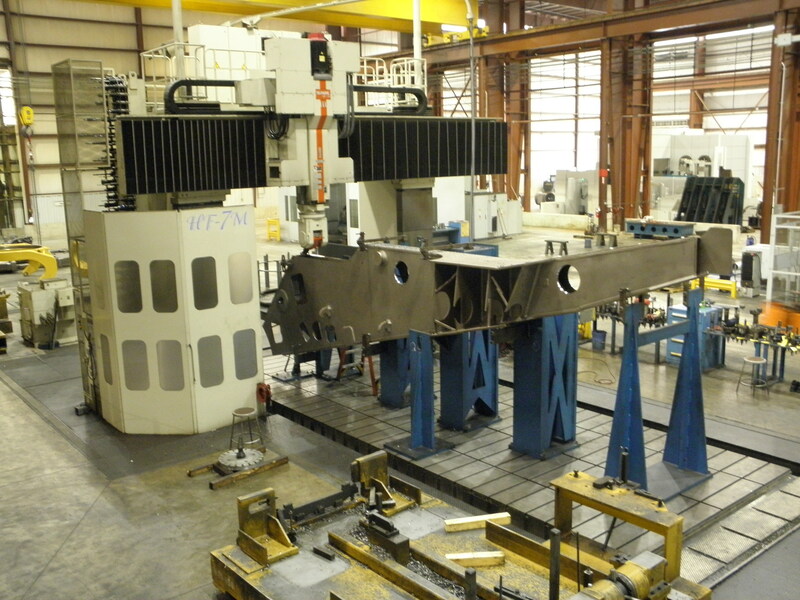 Large machining, large fabrication, and the pursuit of Zero for our customers. The pursuit of Zero for our customers means zero production headaches, zero production delays, and zero tolerance for errors. Our capabilities also include burning and assembly. K&M’s serves customerFigure # 1s in the Oil & Gas, Power Generation, Wind Power, Machine Tool, Mining, Construction, Agriculture, and Locomotive Industries. 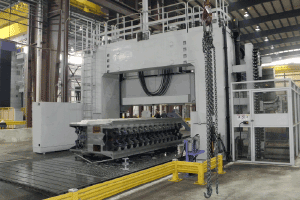 Large Machining at K&M Machine-Fabricating, Inc.
Modern Machine Shop Magazine defines large part machining as the machining of any part that is too large to be moved by a single person or too large to fit in the work envelope of the most common CNC machines. 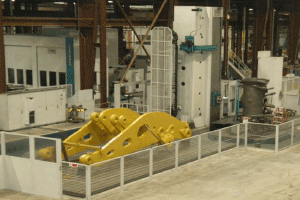 K&M’s large CNC machining capabilities include parts as large as 20 meters by 5 meters by 10 meters and 100 tons. It is always beneficial to machine a part in as few setups as possible to reduce variation, setup time, handling time, and load and unload time. This varation and these times are waste, which add no value to the customer. This is especially true with large CNC machining where these factors can contribute hours to cycle time and throughput time. K&M’s solution to high quality and cost effective large part machining is to machine a part complete in as few setups as possible, ideally in one setup, on a machine whose size closely matches the part size. 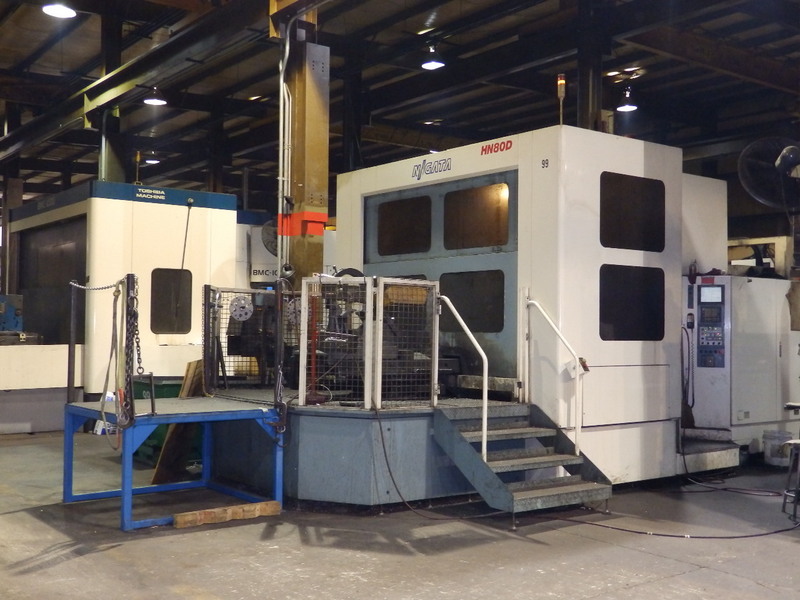 This is accomplished with an equipment list that includes several sizes of large boring mills, large gantry mills, and large machining centers that are equipped with right angle heads, univeral heads, spindle extensions, and probes. K&M matches the machine type and machine size to the part size, part features, and production quantity. This means that each part is machined on the lowest cost machine that is capable of producing the part, while still meeting the objective of minimizing setups and waste. 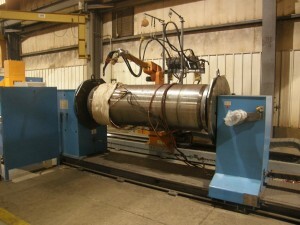 Large Boring Mills at K&M Machine-Fabricating, Inc. There are 19 large boring mills installed at K&M. The smallest is Machine # 115, a Mitsubishi M-HT 13/1250. This machine has a pallet size of 1.2 meters X 1.25 meters. The axis travel is 1.6 meters in X, 1.5 meters in Y, 1.6 meters in Z. Machine #115 is shown in Picture #1. 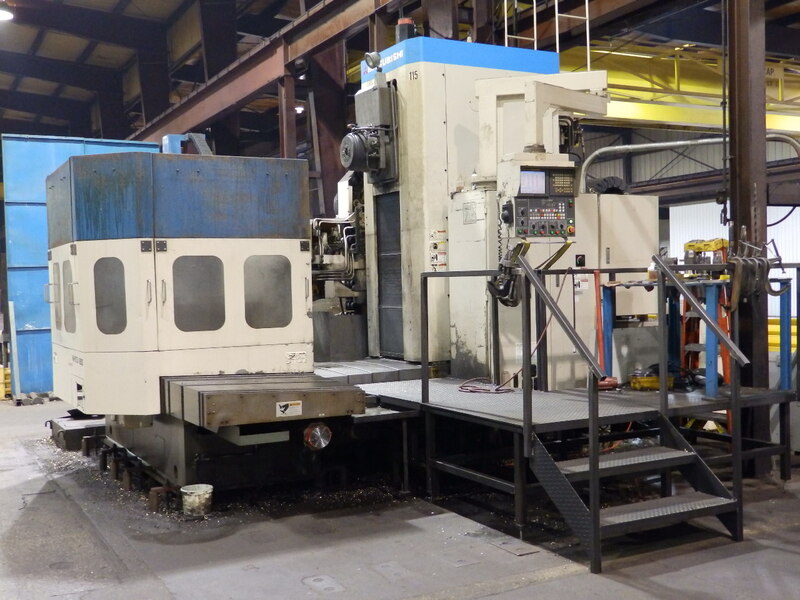 The largest boring mill at K&M is Machine #112, a PAMA Speedram 2000/3. This machine has a rotary table and two fixed tables. 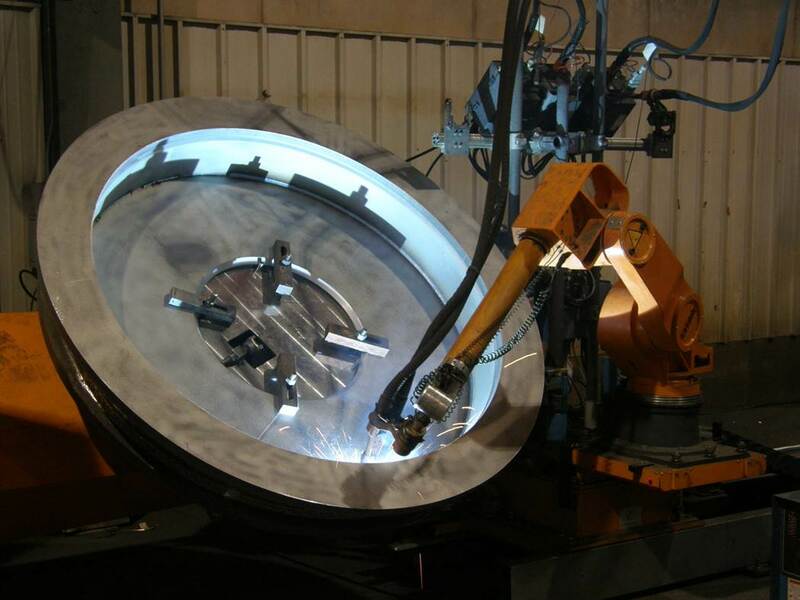 The rotary table measures 3 meters X 3 meters. The two fixed tables are 4 meters X 10 meters and 4 meters X 5 meters. The axis travel is 20 meters in X, 5.2 meters in Y, 3 meters in Z. 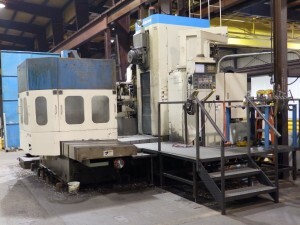 Picture #1 is M115, K&M smallest large boring mill. Picture #2 is M112, K&M’s largest boring mill. K&M has the right size boring mill for your large machining work. 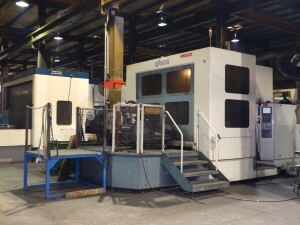 As a direct result of utilizing the right-size machine, the customer is paying for machining time on a machine that is large enough for the job, but no larger. K&M has multiple large boring mills in each size group. This means that there is redundant capacity to accommodate multiple jobs or multiple customers in each machine size. The redundant capacity translates into faster throughput times for the customer. Figure #1 defines the machine group sizes and the number of large boring mills that K&M has in each group. 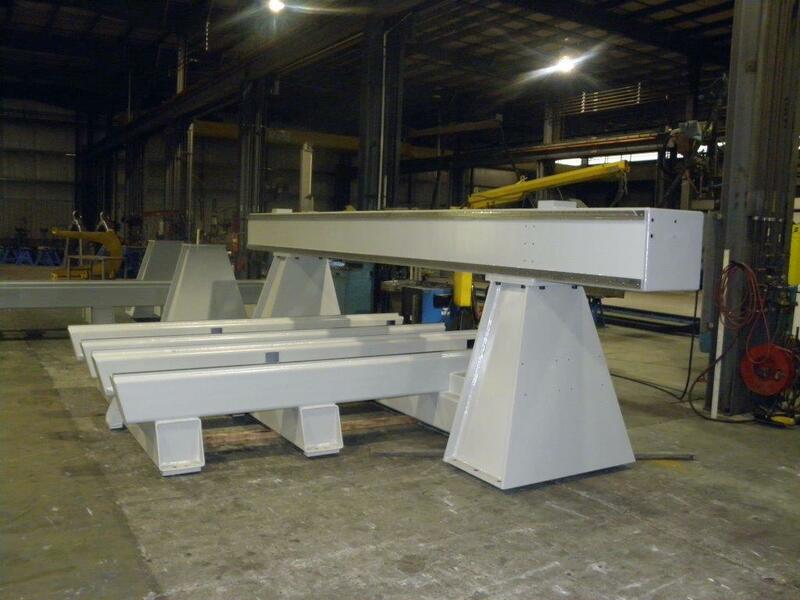 Large Vertical Gantry Mills at K&M Machine-Fabricating, Inc. 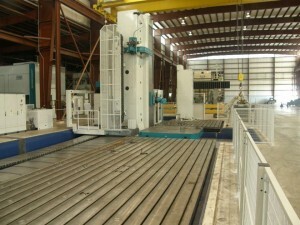 There are 10 large vertical gantry mills installed at K&M for large machining. 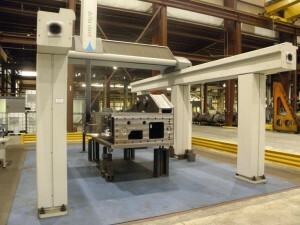 The right size vertical gantry mill is chosen for each job at K&M. This results in the lowest machining cost for each job. Machine # 114 is K&M’s smallest vertical gantry mill. It is a Mitsubishi MVR30. 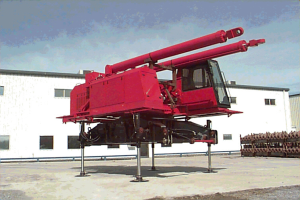 This machine has a table size of 2 meters X 5 meters. X axis travel is 5.2 meters, Y axis travel is 3 meters and Z travel is 1.5 meters. Machine # 111 is K&M’s large vertical gantry mill. It is a SNK HF-7M. The table size is 3.5 meters X 10 meters. X axis travel is 11 meters, Y axis travel is 4.7 meters and Z axis travel is 3.45 meters. Machine # 114 is shown in Picture # 3. Machine #111 is shown in Picture # 4. K&M has multiple vertical gantry mills in each size group. This means that there is redundant capacity to accommodate multiple jobs or multiple customers in each machine size. The redundant capacity translates into faster throughput times for the customer. Figure # 2 defines the machine group sizes and the number of large vertical gantry mills that K&M has in each group. 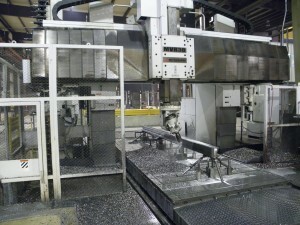 Large Horizontal Machining Centers at K&M Machine-Fabricating, Inc. 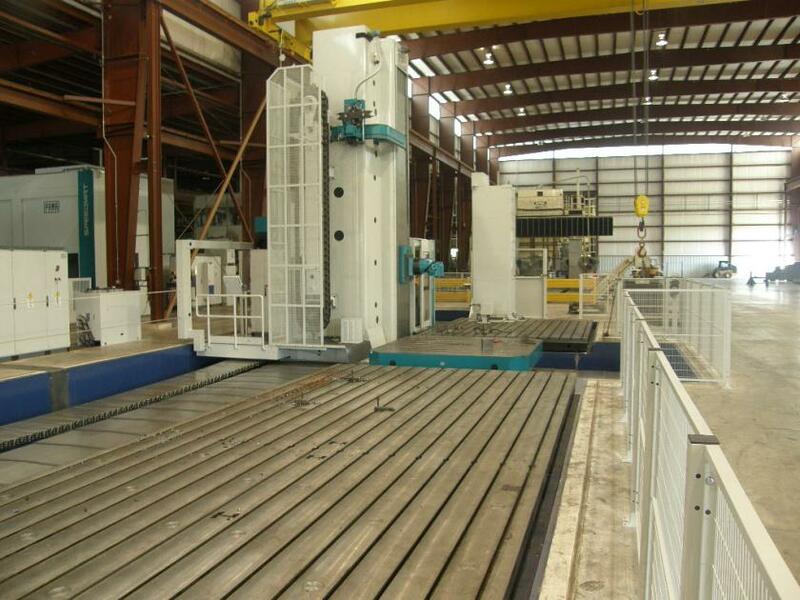 There are 5 large horizontal machining centers installed at K&M for large CNC machining. 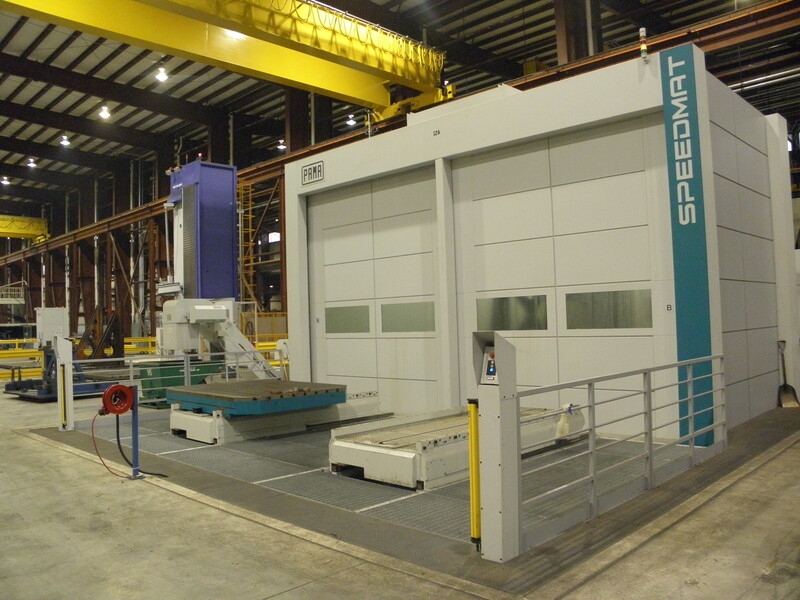 The right size horizontal machining center is chosen for each job at K&M. This results in the lowest machining cost for each job. 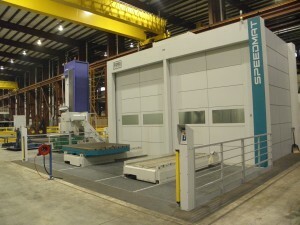 Machine # 99 is K&M’s smallest horizonal machining center. It is a Niigata HN80D. This machine has two pallets that measure 0.8 meters X 0.8 meters each. X axis travel is 1.5 meters, Y axis travel is 1.2 meters and Z travel is 1 meters. 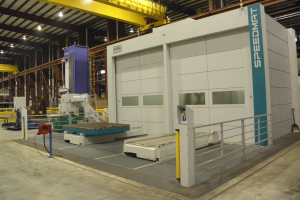 Machine # 126 is K&M’s largest horizontal machining center. It is a PAMA Speedmat 4/160. This machine has two pallets that measure 2 meters X 2.5 meters each. X axis travel is 3.8 meters, Y axis travel is 3 meters, and Z axis travel is 3.4 meters. Machine # 99 is shown in Picture # 5. Machine #126 is shown in Picture # 6. 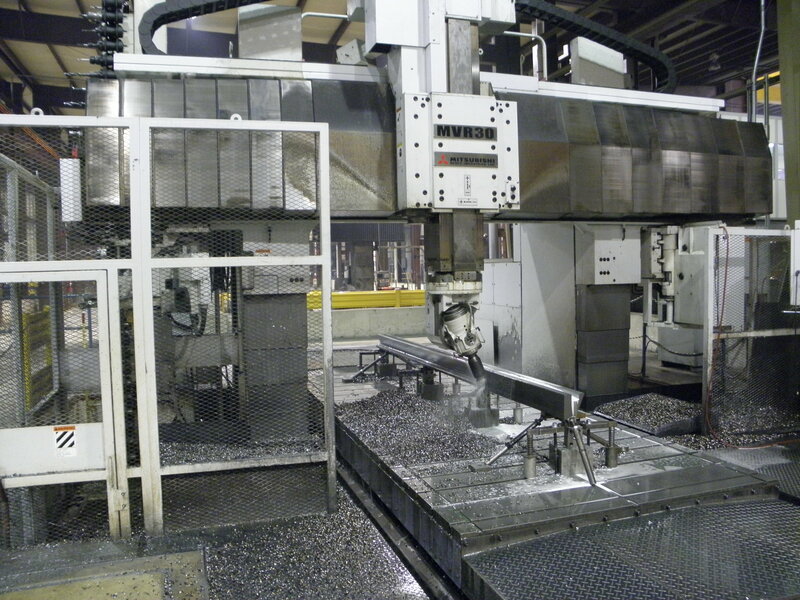 K&M has multiple horizontal machining centers in each size class. This means that there is redundant capacity to accommodate multiple jobs or multiple customers in each machine size. The redundant capacity translates into faster through put times for the customer. Figure # 3 defines the machine group sizes and the number of horizontal machining centers that K&M has in each group. 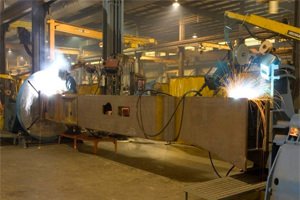 Large Fabrication at K&M Machine-Fabricating Inc.
K&M Machine-Fabricating Inc. has a complete fabrication facility ready to handle your large and heavy fabrication needs. 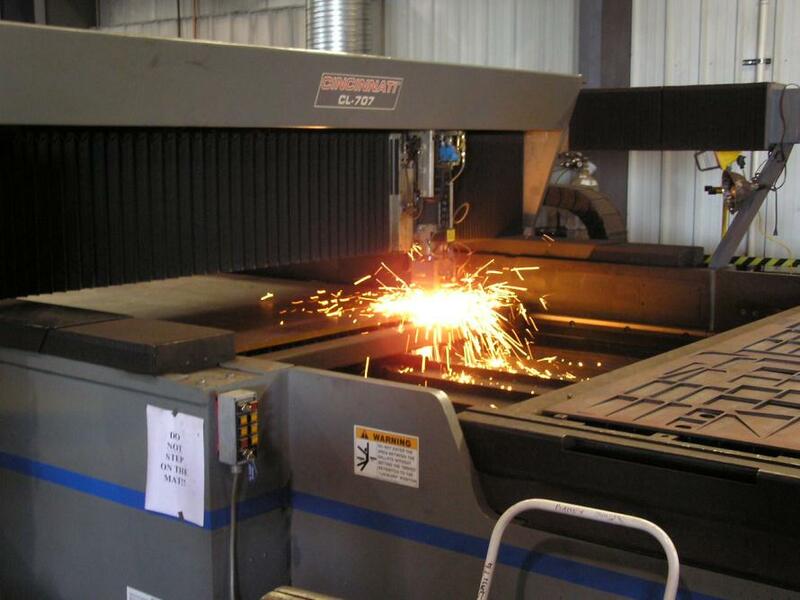 Our large fabrication and large welding capabilities start with steel plate procurement and include burning, forming, pre-machining, welding, blasting, heat treat, UT (ultrasonic), MT (magnetic particle), PT (die penetrant) inspection, paint, final machining and final inspection. K&M can handle fabrications that weigh up to 50 tons. 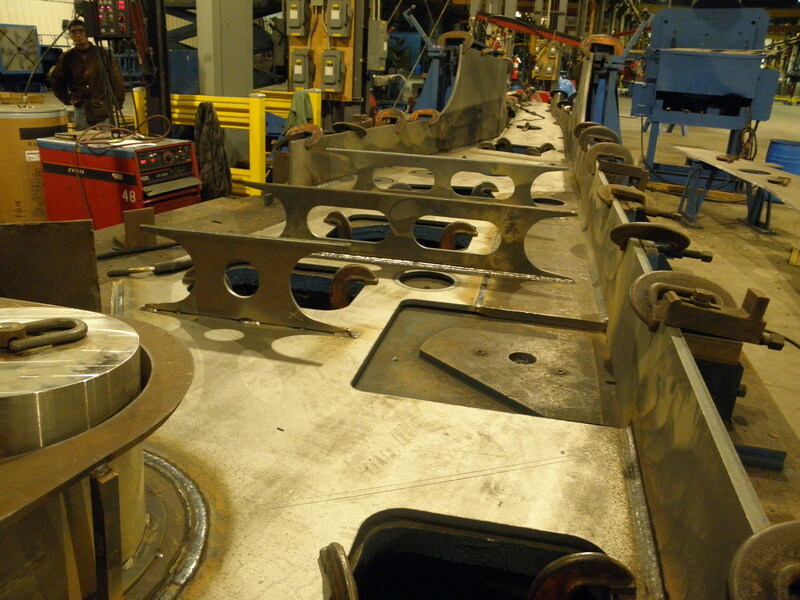 Fabrication begins with steel plate procurement to the customer’s steel specification. K&M procures plate steel from several certified steel suppliers. The steel material certification is provided to K&M along with the incoming steel. The material certification is documented in the K&M quality system and is traceable to each component part and final part of every large fabrication that K&M produces. Traceability is maintained throughout K&M’s manufacturing processes. Large fabrications are tacked at K&M in part specific fixtures or on layout tables. Fixtures for production jobs are designed and built at K&M. These fixtures are used to reduce tack time and to insure dimensional repeatability. For low volume jobs or jobs that are too large for fixtures to be practical the tack operation is done on a layout table. Picture # 9 shows a fabrication being tacked on a layout table. Picture # 10 shows a large fabrication in a tack fixture. In-process dimensions for large fabrications are measured and recorded in K&M’s quality system. 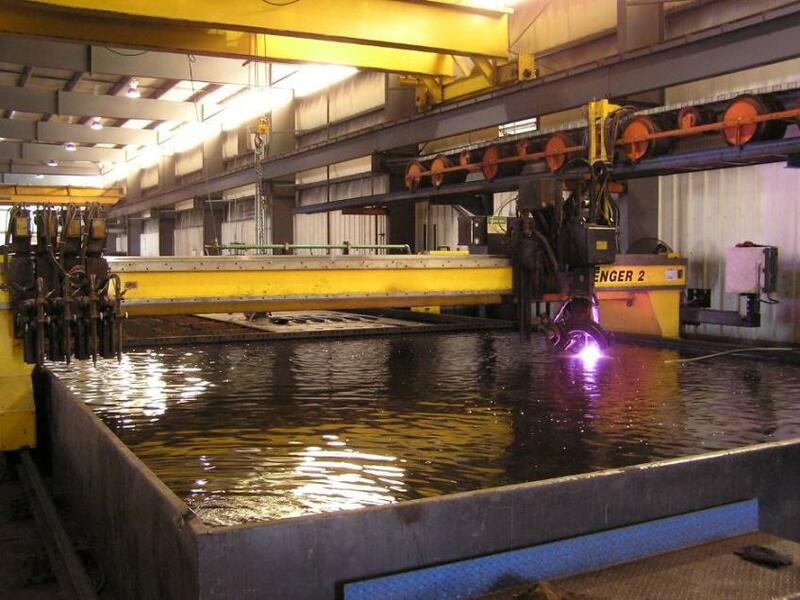 Large fabrications are welded at K&M using the FCAW, GMAW or SAW welding process. K&M welders are certified to AWS D1.1. K&M has two robotic welding machines and two SAW welding machines along with 50 manual welding stations with constant voltage and automatic wire feed. Picture # 11 shows K&M’s tandem wire robot welding in the head stock / tail stock station. Picture # 12 shows K&M’s tandem wire robot welding in the positioner station. K&M uses internal and third party resources to complete required weld inspections. MT (magnetic particle), PT (die penetrant), and UT (ultrasonic) inspections are preformed to insure quality welds are delivered. K&M has a large CMM and a Faro laser tracker. These inspection tools can provide 100% dimensional inspection of large fabrications. K&M has a complete machining facility capable of machining any large fabrication that K&M manufactures. 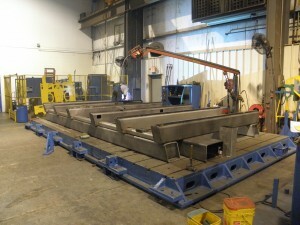 Picture # 13 shows a large fabrication for the machine tool industry. 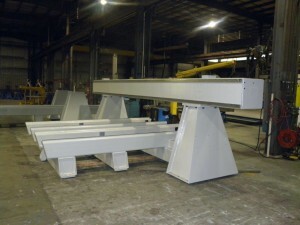 This large fabrication was fabricated, machined, painted and inspected at K&M. No large machining or large fabrication job is complete until final dimensional inspection results are documented. K&M has invested in the inspection equipment needed to insure that large machining and large fabrications meet customer requirements. 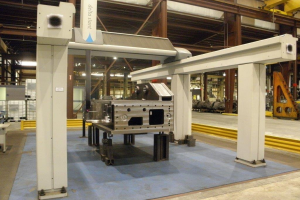 K&M has a large CMM (Coordinate Measuring Machine) capable of measuring parts as large as 3 meters X 6.2 meters X 2.5 meters. For larger parts K&M has a Faro Laser Tracker. The Faro Laser Tracker is capable of measuring any large machining or large fabrication part that K&M can produce. K&M has a large selection of manual gages that are used for in-process and final inspection measurements. All gages and inspection equipment are calibrated and traceable to the appropriate national standards. K&M is ISO 9001 certified. Picture 14 shows the large CMM in action. K&M can complete your large component outsourcing project by performing assembly operations. We have experience with assembly for the mining, construction and locomotive industries. Services include assembly of hydraulic lines, valves, and fittings, assembly of bearings, bushings and other components. When K&M performs assembly operations for you a large component can come to your facility or to your customer’s facility in the state of completion that works best for your process or your customers’ process. K&M is your source for contract manufacturing of large components.